The largest pyrotechnics competition of its kind in the world, the Montreal International Fireworks Competition has been going strong since 1985 and remains one of this city's top summer attractions. In 2019, the Montreal Fireworks Competition is held June 29 through July 27. Shows for the Montreal International Fireworks Competition in 2019 fall on some Wednesdays and all Saturdays. Although the 2019 details are not final, in the past, all shows were scheduled at 10 p.m., and motorists needed to be aware that for all presentations, the Jacques-Cartier Bridge closed at 8 p.m. then reopened at the end of each show. Although no one will argue that buying a ticket to see them up close and personal at La Ronde is the best view in the city, you can get a great view just the same without paying a penny, and it seems like every local has his or her favorite secret spot. From rooftop terraces to mountain overlooks, there are plenty of great vantage points in the city guaranteed to give you a spectacular view. Still, you can splurge a little and see them synchronized to music, up close with the judges at La Ronde, just in front of the Lac des Dauphins. It's a nice treat and more impressive than viewing them for free from a distance, albeit pricey for a 30-minute show. To help mitigate this cost, you can also enjoy a full day's admission to all of La Ronde's rides and roller coasters with the purchase of your fireworks ticket. 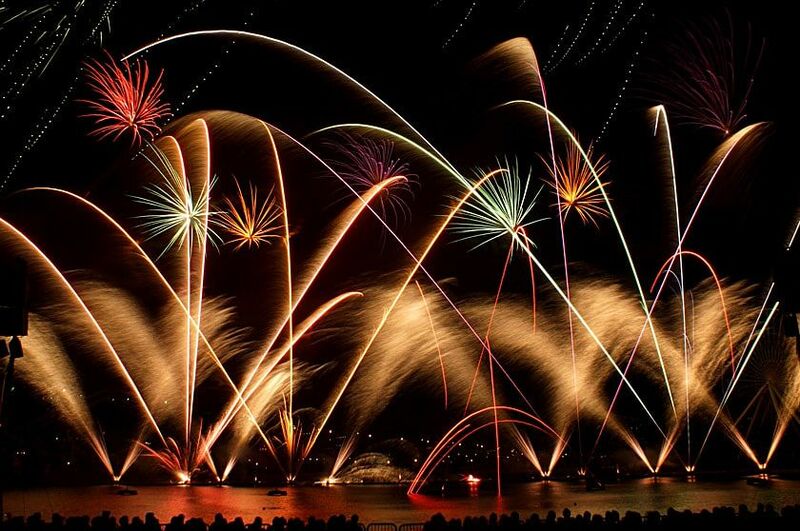 The July 2019 edition of the International Fireworks Competition is expected to continue to be dynamic, welcoming major companies from around the world to put on a show featuring the latest techniques and innovations in pyrotechnic arts. Note that the opening and closing nights of the Montreal International Fireworks Competition are generally non-competition events and typically do not feature a specific country. Each of the other brilliant displays plays homage to their individual countries through an exploration of different themes. Whether you're looking for a luxury room that won't break the bank or just need a place to rest your head while you're visiting the city, there are plenty of hotels and accommodations near the fireworks at La Ronde, especially in Old Montreal. You can try Le Petit Hotel, which is a quick stroll from a variety of attractions, including the fireworks, the Montreal Science Centre IMAX, Pointe-à-Callière, the Notre-Dame Basilica and some of the best baked goods in the city. You can expect to pay the same as what New York travelers pay to stay at a hotel near Times Square. For a bit of a fancier experience, you can also check out the nearby Le St-James, a boutique hotel frequented by the Hollywood celebrities. For a killer deal in Old Montreal, the Auberge Bonaparte offers one of the best prices in the neighborhood—which is still pricey—as well as all-star service and nice room. Although also considered a boutique hotel, you can get a room at the Auberge Bonaparte for around $260 during high season. If all three of these are booked already, you can also try out Springhill Suites, Hotel Nelligan, or Auberge du Vieux-Port, which actually offers one of the best views in the city of the Montreal International Fireworks Competition.